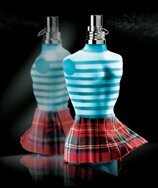 Jean Paul Gaultier will launch the latest limited edition of his Le Mâle fragrance in September, the Kilt Collector Edition. (via vogue.fr) Gaultier has long included kilts in his runway collections, in fabrics ranging from the traditional plaid to black mink. The Le Mâle fragrance includes notes of wormwood, bergamot, cardamom, lavender, orange blossom, cinnamon, cumin, wood, musk, amber, and vanilla. Looks quite silly but it sure is original.. but why mink? That's a little too much if you ask me.